Science vs. Theology? - When a rational mind is running the show, evolution really works. And it doesn't require millions of years. 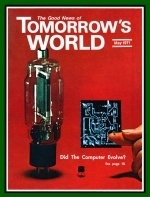 Read about the fantastic development of the computer in just the past 30 years. IT IS impossible to establish the exact date for the birth of the computer. The Chinese abacus goes back to antiquity. However, scientific historians point to Professor Charles Babbage - an English mathematician and eccentric genius of the early nineteenth century - as the father of the computer as we know it today.